Today at Microsoft’s Convergence 2015, Skype for Business was demonstrated, revealing several powerful new features for Office 365 Enterprise users. After Microsoft rebranded its business communication platform, Microsoft Lync back March of this year, it has been working to expand office communication beyond its current instant messaging, video, and voice messaging services. Microsoft’s aim is to have Skype for Business replace traditional phone services as an enterprise’s primary communication platform. Skype for Business is working to achieve this by allowing Skype to provide backend services for phone hardware as well as PSTN conferencing. By doing so, Skype can be used by employees connected at the office through a traditional landline, as well as those using mobile devices, through means they are already familiar with such as joining a conference call by just dialing in. Allowing Skype to replace traditional landlines will provide businesses with a platform capable of handling traditional communication needs as well as provide features only a web-based service can provide. Skype for Business users will be able to utilize the web to share and collaborate on documents in real-time, a feature also found in Microsoft’s Delve app which also recently went mobile, during virtual meetings. To make these meetings more effective, Skype for Business will also include Skype Meeting Broadcasts. 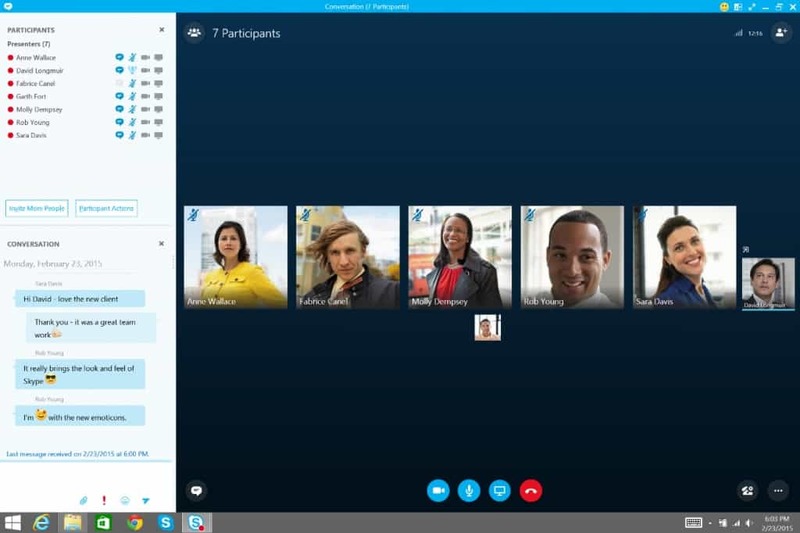 As it stands, Skype can be used for video conferences, but with the update Skype for Business, users will be able to host much larger virtual meetings. After setting the appropriate time and date, users can assign team members who can moderate, produce, and present events. Meeting attendees can be classified as Anonymous, which allows anyone to join as long as they have the appropriate link, Secure, which allows only those invited to join the meeting, and finally Open, which allows anyone from the company to attend a virtual meeting. Users are also able to added applications to virtual meetings such as Bing Pulse and Yammer, which allows attendees communicate to one another during the meeting. With this update, Skype for Buisness will provide companies with a much more robust communication system, including featuers only made available on the web. As any company who has already updated from Lync to Skype, these new features will be made available tomorrow. If your company uses Skype for Business (or Lync), which of these features do you think will be most useful for you? Let us know in the comments below. Which Skype for Business features are you looking forward to using at your company?